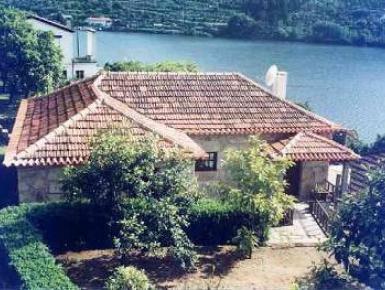 Nicely furnished typical house of the Douro Valley region, located in the village of Porto Manso. Distance to Baião 20 Km, to Marco de Canavezes 22 Km, and 75 Km to Porto. Located on the banks of the Douro river, in a very quiet area, guests can enjoy the local natural beauties by walking the surroundings. The house overlooks the river and consists of 3 bedrooms (2 doubles, 1 of them with ensuite shower room, 1 twin), 1 complete bathroom, living room with dining area, satellite TV, settees and kitchenette, a wide balcony and surrounding terrace. This house is located on the grounds of the farming estate Casa da Torre, and guests have access to a swimming pool (30 m from house), with magnificent views over the river. Daily cleaning and daily fresh bread and fruits from the ecological orchard included.